Consider this a kind of a respectful rant if you will. I grew up in the East Bay and the A’s are my team. I’ve been vocal about that for a while and it’s no secret. But unlike a lot of A’s fans, I do not hate, despise or whatever you call it with the Giants. They are the other team across the Bay. They aren’t a real rival to the A’s. I appreciate and love the Bay and I want good things for my area. 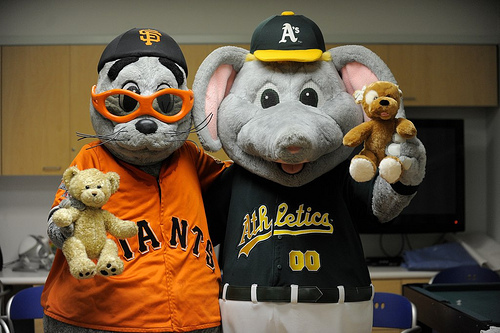 With that said, the Giants winning another World Series would be very tough on me as an A’s fan. Part of it is because I wish my team could have beat the Tigers. But the real reason has nothing to do with the game, but the aftermath. Since the 2010 World Series win, I have never seen so many bandwagon fans in my life. People who have never even mentioned a word of baseball to me started to act like they’ve believed since day one. The 2010 Giants created what we saw in Boston after the 2004 World Series. The bandwagon grew out of control. Now it was the cool thing to do. Because of that, the media has picked up on it and these “fans” have given me a hard time. These people always want to talk down on Oakland as a second class city. They talk down on the A’s as if they are this eye sore in the Bay Area. It’s been tough with all the attention going to the Giants like this. I have friends who have been Giants fans since they were in diapers and for them, I am happy. They deserve this. But that’s only a handful. I’ve encountered more people who are on the bandwagon just because it’s the cool thing right now. Because of that, we have the above video where people wearing Giants gear show up to A’s games. I see that way too often. The Giants aren’t even playing the A’s and yet these people in Giants gear show up. A’s fans don’t do that, so why do Giants fans want to rub it in? I’ll never understand why. I am only observing it as an outsider. Giants fans probably don’t notice what they’re doing and don’t care. They’re enjoying the ride and the true fans deserve it. But it’s a shame that because of all this, people like me get ragged on, insulted and pushed aside. These guys can get along. Why can’t we do the same? I have no problems with the Giants as an organization (except for whiny general manager). I have no problems with the players on the team either (except for Brian Wilson — he just looks scary). They’re a good baseball team and one that I appreciate. It’s all the surrounding things about it that get to me. So if the Giants win this World Series, I will have to hear it from the bandwagon fans, see all the love and embrace the insult. It’s only the bandwagon fans that are doing it and I see more of them than real fans. And it’s probably an inherited culture now to laugh and toss the A’s around. Probably stemming from the team’s desire to not treat the A’s as a neighbor and not help out with the San Jose situation. I wouldn’t be all super depressed or anything like that if the Giants win the World Series. If they do, good for them. They earned it. I accept it. Nothing I can do to change it. I just don’t want to deal with the same stuff that happened in 2010 multiplied by double or triple. I feel like I am being attacked for no reason. It’ll be relief if the Giants don’t win and I don’t have to deal with all this again. But I have no control over that. I just have to watch the World Series and see what unfolds. I hope that the aftermath won’t be as cruel as it was a couple years ago, but as it appears right now, I’m just being an optimistic fool. ** To all the real Giants fans that didn’t jump on the bandwagon, who’ve been to those cold night games at Candlestick, you deserve to see your team succeed and I am happy for you. It’s too bad I don’t see enough of you and more of the fake fans a lot more since 2010. This entry was posted in Column, Detroit Tigers, MLB, Playoffs, San Francisco Giants and tagged 2012 World Series. Bookmark the permalink. my future wife was pictured watching us play catch, the photograph I still have to this day, Montefusco ended up becoming my favorite player all-time and we corresponded briefly that year, our school got tickets from him to a game he pitched against the Reds. And I would have liked to see a Bay Bridge World Series. Keep it all in our two backyards, if you will. Southern fried chicken in one yard and the famous BBQ ribs in the other yard. All the good stuff, you know what I mean, that’s the thing I lament about in not having a bay bridge world series. It would be great for the economy on both sides of the bay, too. fan and I guess basically I jumped from the East Bay to the West Bay. I do have history on both sides of the bay and I have good memories. What sticks out is, I attended countless Giants games both at the Stick and Pac Bell Park, while I attended only 4 A’s games in my lifetime. I am addicted to orange and black. And not on a bandwagon. I completely agree with you! I am a born and raised SF Giants fan, and seeing how we won our first World Series in 2010, I see bandwagon fans left & right. All of a sudden they know the game, yet they never came out the closet when we weren’t doing too well. I see old friends who all of a sudden are wearing Giants gear, and going to games. Then you get the ones that make good money and spenf a fortune on playoff tickets, yet don’t even know any history or players! Then you have fans like me, who would LOVE to go to a play off game but can’t afford it. It makes me sick! I am sick of them just like you my friend. I wouldnt even give them a high five! Thats how much they make me sick. LOL but seriously, baseball is a sport you grew up on, its like an acquired taste. You either like it or don’t. You can’t just think you do, and then get all the bragging rights and think you could talk crap to A’s fans. I have plenty of A’s fans that I like to joke around with and they never take it seriously, but these bandwagon giants fans think they could say whatever they want whenever they want. Baseball is a wholesome sport, with passion and suspense of not knowing til that last inning if you won or not. I am just sick of these fake fans and couldn’t have said what you just did any better. BRAVO! Sam, tonight there will be a TV show about the Oakland A’s: A Forgotten Dynasty. I think details are at csnbayarea.com. It talks about the Owner Finley/Reggie Jackson/Rollie Fingers A’s era. You would love this show. Sam, I re-read your article and the meaning of the word “bandwagon” just clicked in my mind. I think I didn’t truly understand or used the word the right way. In 1974 I caught the SF Giants fever because I loved their uniforms, the orange and black, the fog rolling in the Stick. From 71 to 73, I watched a lot of Reggie Jackson. He was a favorite player. But I hardly went to games, my Dad wasn’t an A’s fan, he liked the Giants. I went to Giants games, and they grew on me. I invited my friends to join me to Giants games. I stuck with the Giants all through the years they had losing seasons. I cheered as hard for Willie Mac Covey and Jack Clark when they struck out as opposed to hitting home runs. I loved the orange beaks on Giants’ caps. But it is TRUE…since 2010 I saw that the number of Giants fans doubled. A large bandwagon, I might say. My only question is, what MLB team were they fans of before they jumped on the Giants bandwagon? Or did they just jump straight from their tea table to the bandwagon?